Google TV is back to take over the living room, but this time it’s called the Chromecast and it goes for $35! Google had their Breakfast with Sundar Pichai event on Wednesday morning, and boy did they have quite a bit to show off. They showed Android 4.3 JellyBean, the new Nexus 7 and perhaps their best kept secret, the Chromecast. I say best kept secret because no had any idea that we would see it until the night before the event where the name was leaked in a Best Buy document. The Google TV tried IPTV with cable TV but it didn’t really work out because of the low adoption rates. Now Google’s taking the route of the Roku and Apple TV. Chromecast is like Google’s latest products, connected to and heavy reliant on the cloud. No local content sources supported here. The Chromecast is like a small USB dongle that plugs into any HDMI port on your TV or monitor. The device is literally the size of a thumb drive and it just plugs into TV through HDMI and there’s also a microUSB coming out the other side of the dongle, for power, that plugs into a USB port on the TV or into a wall socket through the included wall wort. The device is extremely small so there’s no chance for any ethernet connections but there’s 802.11n WiFi, with surprisingly no support for the newer 802.11ac standard. Google says that the device will either make itself a part of your existing WiFi network or broadcast its own WiFi hotspot. As of now there’s no word on the internal specifications yet but there’s probably nothing special because all it needs to do is run simplified Chrome OS, which is low key to start out with. The Chromecast can do this cool thing where you turn it on through your phone or tablet and it switches on your TV and puts it into the right input. If you are interested in other gadgets, check this out. Google directly came out and said that Chromecast is a way to get the content on your devices onto your TV. And that’s what it does. When you run a supported app like YouTube there’s now a Cast button that casts the video onto your TV and it continues to play even when your device goes to sleep because the content is coming directly from YouTube as opposed to how AirPlay works where the content goes from the iDevice to the TV. You can also queue media, set your phone aside and kick back. You can play/pause and fast forward/rewind with your phone to use it as a remote As of now the Chromecast works with YouTube, Netflix and Google Play All Access or Pandora for music. You can also access the Play Store to use existing Google TV apps, and speaking of Google TV, there will be a Chromecast update pushed to them soon. The Chromecast is coming with 3 months of free Netflix for a limited time, and that offers over by the time you’re reading this (sorry for getting you excited, if I did). Google’s put out an API for Chromecast to get more apps and it’s already been leaked that HBO Go, Revision3, Washington Post and Songza are making apps. My favorite feature is the ability to run Chrome on your laptop and cast your Chrome tab onto the TV. Think of it as AirPlay Mirroring for Google Chrome. It’s still in beta with some lag but it’s almost there. Chromecast works with Android, iOS, Mac and PC. 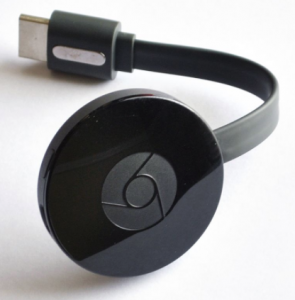 The Google Chromecast seems like an awesome idea and Google did it right this time. The Chromecast is the Apple and the Roku combined in a tiny little package. The Chromecast is a great device and if you want to make your TV smarter you should buy this, if you can find one because the Chromecast is completely sold out on Google Play, Best and Amazon. You really should buy this because it’s pretty cheap at $35 because a lll other competitors that do the same are much more. The Chromecast is a step in the right direction and should only get better. Copyright © 2019 Penny College. Theme: Creative Blog by Bishal Napit. Powered by WordPress.